Often my dislike of baking biscuits sees me attempting to turn a biscuit recipe into one for a slice, and yesterday my friend Charmaine’s Facebook photo of her Peanut Butter Biscuits had me once again starting down this path. And yay – I think it worked! 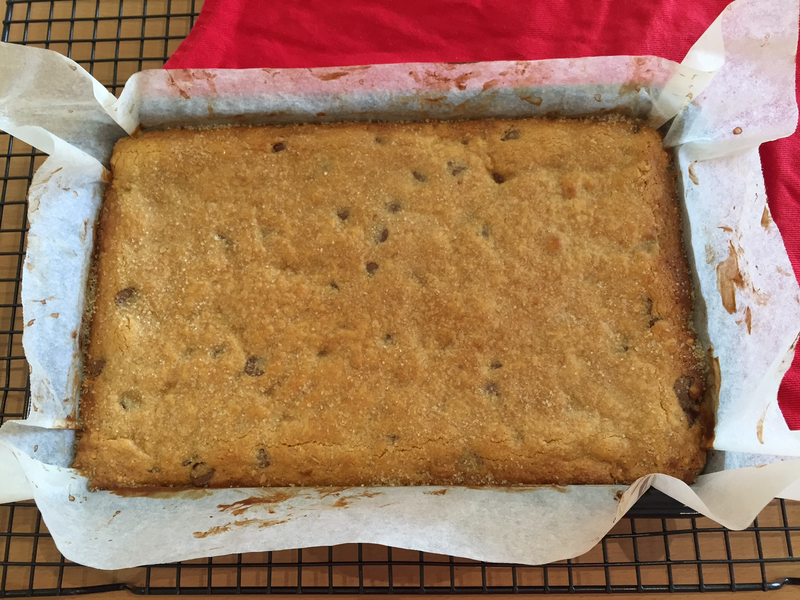 What follows is a slight variation (I added choc-chips) on the original recipe by Paula Deen, which results in a mouth-watering and chewy slice. It took me all of 5 minutes to mix up and whack this gluten free dessert option into a tin and then into the oven – just in time for a friend popping in for afternoon tea. Using the quantities below, this slice makes 24 pieces and costs under $6 to make, less if you prefer to leave out the chocolate. Thanks for the recipe, Charmaine. Combine all ingredients except raw sugar in a bowl and box well. Press into a lined 20 x 30cm slice tin using clean, wet hands. Sprinkle raw sugar evenly across the top of slice. Bake for 35-40 minutes (slice should be brown on top, firm around the edges and fudgey in the middle. If slice browns quickly, cover in foil for remainder of cook time. and allow to cool before cutting. Boil the kettle for tea and enjoy.